NASA's space telescope snaps a breathtaking sight in space. NASA's Spitzer Telescope recently captured a breathtaking infrared image of a "red butterfly" along with thousands of baby stars. 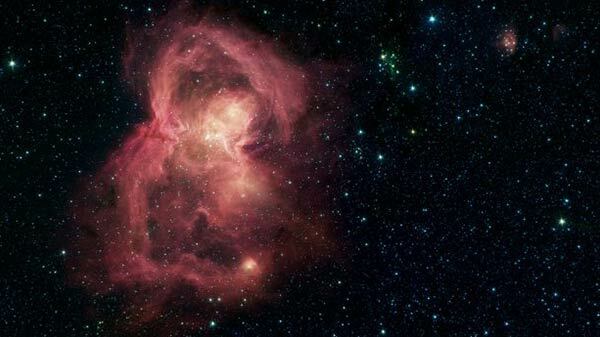 Dubbed Westerhout 40 (W40), this "red butterfly" is actually a nebula, a massive dust cloud that forms new stars. NASA, in a press release, said that its two "wings" are huge bubbles of hot interstellar gas that come from warmest and largest stars in that region. The image is actually an amalgamation of four images captured through the space telescope's Infrared Array Camera (IRAC) during its mission that shows the nebula reflecting red, blue, green, and orange hues. W40 shows how star formations cause the destruction of clouds that develop them. The force of gravity produces clumps inside these huge clouds of dust and gas, and at times these clumps reach a critical density enabling star formation at their center. W40 is around 1,400 light years away from the sun and is approximately the same distance as Orion nebula which is located in the Milky Way. Recently, NASA's Hubble Space Telescope managed to snap an orb of light which is a massive elliptical galaxy comprising a whopping 200 billion stars. The M49 was the first member of the Virgo Cluster of galaxies to be discovered. It measures 157,000 light-years and is 56 million light-years away. The Hubble telescope also captured two colliding galaxies forming a super-galaxy. These galaxies were discovered in 1784 by William Herschel. John Louis Emil Dreyer described NGC 6052 as "faint, pretty large, irregularly round."